What effect does yoga have on scoliosis? I was recently asked a question via email. Can yoga fix scoliosis? It’s certainly not the first time that I’ve ever been asked about scoliosis and I’m sure it won’t be the last. It’s a seemingly simple question, but it bends in a direction that makes me wonder about our larger expectations for our yoga practice and our desire for a simple answer to what seems like a simple question. The truth is, it’s neither a simple question nor a simple answer. As a yoga teacher who often gets asked about injuries and conditions, I always try to give a realistic and balanced answer. There are both limitations on science and modern medicine as well as limitations on yoga’s ability to heal or “fix” things. Of course, anything is possible, just not always probable. Before I digress too far, let’s come back to the question at hand. Can yoga fix scoliosis? The simple answer is, I don’t know. The more complicated answer requires a whole lot more information about a specific person than the general question about whether yoga can fix scoliosis. There are different types of scoliosis with different causes. This means that the management of each type could be different and the potential for fixing is also different. The potential expectation that yoga will fix a scoliosis may be unrealistic. Managing and slowing the progression of a scoliosis may be a bit more realistic. Is it impossible that scoliosis can be completely fixed? No, it’s not impossible. I’m sure there are a few cases where certain types of scoliosis have been fixed with good therapeutic yoga. We just have to be aware of the various factors that would allow for this to happen. Scoliosis is a condition where there is a curve in the spine that goes sideways (laterally). There can be a single or a double curve. There can even be a twisting of the vertebrae mixed in with the sideways bending of the spine. How do these get into the spine in the first place? There are two categories of scoliosis that we should consider. The first is one that includes potential genetic level issues or diseases that can affect the formation of the bones. This group is sometimes referred to as structural scoliosis. Sometimes there is a genetic coding that has the spine doing its side bending and sometimes it’s the result of other diseases such as cerebral palsy, muscular dystrophy and others that can cause the same problem in the spine. This is the more extreme of the two categories and is often the one that leads to the rods being placed along the spine to prevent it from heading further into its bends and turns. In this type of scoliosis we will often find a rotational component that leads to the appearance of a hump on one side of the spine and we may see it as the rib cage being shaped differently on each side. The likelihood that a yoga practice is going to fix this type of scoliosis is less than the next category. That doesn’t mean people can’t benefit from a yoga practice, but managing expectations is important. What can easily be achieved is that we slow the progression of the scoliosis or actually maintain it where it is and arrest the continued progression of the problem. The second type of scoliosis is more of a postural type. These are the more mild cases that are often referred to as functional scoliosis. There are certainly a number of ways that a scoliosis can get started. In these cases what I often find is that the pelvis is uneven on one side or the other. There are a number of pieces that may fit together here. How did the pelvis get like this? What effect does it have on the sacrum? How does this lead to scoliosis? Scoliosis commonly occurs in adolescent girls. What is going on around this time to trigger scoliosis? Growth is the simple answer. Bones and muscles may grow at different rates from one another. The right side or the left side may grow at slightly different rates from one another as well. What this can lead to is an imbalance around either side of the body and specifically at the pelvis. It’s the legs and their growth that may end up having the largest impact. If we develop one leg longer than the other we can end up with a leg length difference. This leg length difference then has the effect of tilting the pelvis in one direction or causing one side to rotate forward or back relative to the other side. Any of these scenarios can lead to the sacrum being tilted off to the right or left. I often find that the more mild cases of scoliosis in the lumbar section go along with a pelvis that is out of alignment. Although work along the spine itself is beneficial, we don’t want to lose site of the bigger picture. If we can recognize our underlying problems then we should address those as well. Perhaps it’s getting our pelvis into alignment, or addressing a leg length difference we notice in ourselves. If these are functional then we can change the musculature to get the pelvis back in the right place. For instance, sometimes a rotated pelvis on one side creates that longer leg. If so, can we undo the muscles that create that rotation in the pelvis? If it’s an anterior tilt, then we might do extra postures that lengthen the hip flexors in general to allow it to rotate back a bit and be more neutral. This could take pressure off of the sacrum and over time deconstruct that scoliosis. So certainly asana used intelligently and therapeutically can impact this type of scoliosis. But it may be too much to lay all of our hopes on the asana alone. It’s often helpful to have a therapist, perhaps craniosacral, chiropractic, osteopath, or darn good massage therapist who can recognize not only the scoliosis but also the potential underlying causes of it. As much as some of you would like for me to give you some specific asana to treat your own scoliosis it would be disingenuous of me to give some generic sequence that might help. We would need to look at all of those underlying causes and work with them over a long period of time. My recommendation is that you should start by looking at the pelvis and see if you can tell if one side is rotated more forward or back than the other. Perhaps assess the person in a virasana or supta virasana. I always end up stressing the big picture and the interconnected nature of the body. It’s so important to stop trying to see the body as parts and pieces that have been “put” together. They haven’t, and as people interested in our bodies and its function we should change this pattern of thinking and continually remind our selves that the body has formed and our patterns have also formed. Undoing them can take time. Can yoga fix scoliosis? Maybe not completely, but there is definitely no harm in trying intelligently. thank you so much for your answer. 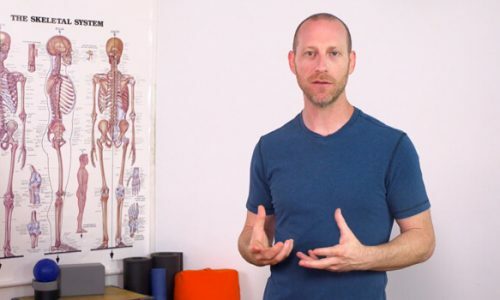 Even though I was secretly hoping there will be a trick to fix the scoliosis with asana, I’m rather grateful for your holistic approach for explaining it. I’m already considering some kind of theraphy but still I’ll give myself few years to see how my yoga practice will affect my condition. Won’t put too much expectations, as you advise, but as a yoga practitioner and in always search for answers, I’m interested to see how the condition will be influenced. Thank you very much for your advice, very much appreciated. If you ever consider giving a workshop in Barcelona, let me know. It will be great to meet you in person. You’re welcome for the answer, as non specific as it is. Please keep me posted on what experience you have with asana practice as well as with therapies you choose to pursue. you can go to a Dorn therapist who can assist with the imbalance that you experience. non-invasive therapy. highly recommended! As usual you are a big help! This article is like you were reading my mind because I was already about knowing something more about this topic. A new female student of mine has a very deep thoracic scoliosis. She joined my classes after couple of years practice mainly in Sivananda- style. She has strong and very, very flexible body, so she can easily go for eg.trough 2nd series. But the question is if it is good for her to do for eg. very advanced backbends? Does it not deepen her problems? I tried to speak with a doctor, but unfortunatelly he has only a small idea about what is going on on the yogamat. Are you able to answer my question in some way? Only the greatest of yogis can know the future. I’m sure its only because they are in the moment. Certainly, you are correct in thinking that certain postures may be harmful long term for this student. It’s hard to say whether or not it will be deep backbending or not though. My initial thoughts however is that I would be more concerned about deep backbending if her scoliosis was in the lumbar region where the majority of backbending occurs in the spine literally speaking. Time will tell and I would continue to proceed with a questioning type of mind. Having both a lumbar and thoracic scoliosis, I have spent about 1,000 hours of practice over the last year trying to find out if yoga can fix it. My experience matches your comment that a misaligned pelvis is the central issue with scoliosis coming from postural issues. I have found both kurmasana and a range of padmasana postures very useful. I have now reached the stage that the spine is starting to open with some quite spectacular sound effects. Are these a cause for concern? More information is needed. In which postures are the sound effects being heard? Is it as you go into them or once you are in them? When you say that the spine is starting to open, what do you mean by that? Do you mean more flexible and if so in what way? that can teach a way to assess yoga practicioners for physical imbalances. I have had little training about 8 years on posture assessment but would love to once again relearn and refresh this ability. Any information would be most appreciated. It often gets mixed in with an adjustment course but keep an eye on the schedule as I love doing it. I’m doing it in Asheville, although by a different title and a little bit of adjustments in it September 14-16.
as someone with scoliosis who’s been practicing for 12 years i can certainly say that yoga has greatly helped me deal with the pain that comes with structural misalignment. yoga opens my ribcage (which allows me to breathe deeper), side-body and pelvis so that i feel taller and more aligned. i know it won’t cure me but it has helped me maintain flexibility in my spine, stretch the shortened spinal muscles, and even obtain balance in my hips. although i am a massage therapist, yoga has led me to a deeper understanding of my body and how the subtle movements and nuances can affect and improve the condition. twists are particularly beneficial for me as well as side-body stretches (i love janu sirsasana and utthita parsvakonasana). i’m so used to my scoliosis that i have to be reminded why i struggle with something like grasping my wrist in a bind on my right side…oh yeah, it’s because my ‘hump’ gets in the way of rotating my arm! it takes an educated teacher to recognize that a student with scoliosis make look different in a pose – i was often told to pull in my ribs or adjust my body when in fact i was actually correctly in a pose, it was just my “crooked” ribcage that gave the appearance i wasn’t. as you pointed out, it’s important to recognize the different forms and severity of scoliosis and to understand limitations which vary from person to person. Thanks for sharing your experience with scoliosis and especially reminding us that you will look really different than the ideal in any number of postures… even though you are doing it correctly. Thank you for such an insightful piece! I also feel like you were reading my mind – having discovered a scoliosis in my early teens and been advised that nothing could be done, it is only in the last few years having started ashtanga yoga that i have begun to wonder, and perhaps secretly hope, that doing the practice might at least reduce the imbalance slightly. I have an uneven pelvis, one leg a couple of centimetres longer than the other and a curve in my spine (the degree of which I am unsure). I just wondered if this unevenness of the pelvis could perhaps be the cause of a pulling pain I get in my hamstrings at the sit bones. I first had problems with this on the side of my shorter leg and now months on I am having the same pain on both side (most notably in prasarita podattanasana, kurmasana and upavistha konasana).I realise this is a very specific question and may be hard to answer in writing but any thought you might have would be greatly appreciated. It’s very possible that there is a relationship here… please read two other articles and see if it gives you some ideas. Hi. I know it’s been a while since your post, and hope you’re doing better now. Just sharing my own experience, it may help others who later read the post. I experienced pulling on both my legs as well, and uneven pelvis of course. I couldn’t go deep in many forward bends, and my yoga practice wasn’t helping. I saw an osteopath who worked on my pelvis, and the pulling was gone. 5-6 years have passed, I still have problems with that pelvis, it rotates from time to time, but no hamstring pull. 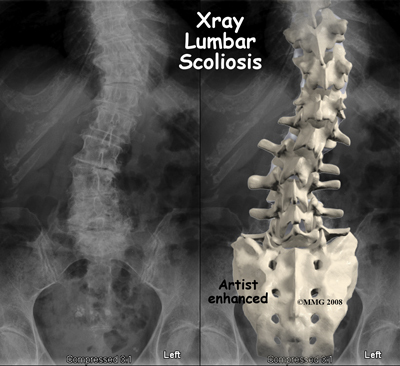 I took X-rays in 3 consecutive years to see how my practice was influencing my scoliosis. Good news is that each year the curvature lessened! Great article. As someone with a scoliosis (congenital and probably related to Ehlers Danlos hypermobility syndrome), I get very fed up with books, articles, teachers implying that yoga can ‘fix’ me – whatever that might mean. Though yoga offers great benefits in stretching muscles and fascia that are pulled into chronic contraction by scoliosis, it can’t change my skeleton, which is the way it is due to my genes. I would also note that a misaligned pelvis can be the RESULT of a genetic scoliosis, not the cause (though it can undoubtedly sometimes be the cause of a functional one). As a result of the pull of my spine, my pelvis is anteriorly rotated and anteriorly tilted. Though I have minimised the tilt by creating strong abdominals (my hip flexors weren’t particularly tight, due to Ehlers Danlos), I cannot change the skeletal structures through yoga. At the end of the day, yoga is not about creating a ‘perfect’ body, but about being present to the experience of the body I have, on physical, emotional, mental and energetic levels. What is that prayer about having the courage to change what we can change and accepting what we cannot? Thanks for sharing your story and personal experience. I could have been more clear that it seems that the functional type may come from a misaligned pelvis. I totally missed, but do agree that the reverse can also be true and more likely from a genetic type. Thanks also for reminding us that it’s about the felt sense, not trying to get to some perfect place that, of course, doesn’t exist! You were very clear – just adding a bit of extra! Thank you for the wonderfully informative column. As a yoga teacher, the questions of “what to do?” and “how to fix” often arise. Like you, I encourage my students to use this “affliction” as an opportunity for svadhyaya (self-study) and vairagya (detachment). I often think that part of the struggle is to let go of this notion of “cure”, and to view the path as a method for relieving pain, developing strength and flexibility, and bringing peace of mind. As a practitioner with scoliosis, the physical “twists and turns” have guided my practice through the years and I believe have contributed to minimizing the more debilitating effects of scoliosis that come with age. Heyam duhkham anagatam (II.16 – The pains which are yet to come can be and are to be avoided). Be well. Many people have commented on the word usage “fix”. I have another article brewing for some time… it’s half written actually about creating space for change to happen. That is one of the main roles I feel that I have to play as a teacher… creating and holding the space for people to change in. NOT trying to fix them or change them, but draw it out of them. Sounds like you have a similar idea in mind. I’m totally with you on this Susan and David. I sincerely agree. My own practice has grown due in large part to my teachers sharing the “possibility” of what I could become. In my own humble way, I hope to do the same for my students. From your column and responses, it feels as if you do the same. Thanks, and I look forward to your next article. I had mild scoliosis that manifested itself in very uneven hips and my back would lock up. My one hip noticeably jutted out while the other side barely had a curve. I started doing power yoga and found immediaterelief for my back. After about 2 years, my hips were completely symmetrical. I hadn’t even thought about it and one day was completely surprised. Having a strong core has helped my posture in all parts of my life. I can sit and stand tall now and my posture is so much better. With mild scoliosis, did you do even poses on each side of your body? I always try to focus more on the weak side and work a little extra on that side. It’s great to hear that your hips are completely symmetrical, but how do you know that? Is there a way that doctors measure that? I have severe scoliosis but my doctors never measured my hips, they only observed the (a)symmetry, but with no actual exact measurements. So then, how can progress be determined with no actual measurements? How can observation be completely accurate? Maybe your doctors have other ways of measuring symmetry, or is it you who determined that your hips are symmetrical? Even so, feeling good in your own body is an important aim when doing yoga and I can, too, attest to that. I feel atuned to what’s happening with my body and my posture has definitely improved, so have my muscles gotten stronger my body feels more balanced. Thank you so much for the information. I have scoliosis and from my personal experience, it is a daily maintenance. I find that doing hip stabilizers help . Another thing I do, is put a block above my knees, bend my knees and place my feet on the wall, creating a 90 degrees angle. My arms are resting along my body. As you resting your body to the mat, scan your hips and shoulders. Are they touching the mat evenly? Your job, is to try to find a balance between the right and left side of your hips. Stretch stretch and stretch. Thank you for all your great articles. •	the memory of me starting to have a terrible breath, a breath very short, very high (a thoracic breath), from the mouth and full of anxiety! this memory came back from my unconscious..very recently and probably because now I am putting a lot of attention on breath! In my long experience with scoliosis (starting from taking flight from surgical intervention, corsets, …postural..) I have also met bioenergetics exercise in a medical center in Rome specialized in scoliosis therapy and I finally, now, I recognize that yoga (Ashtanga Yoga) as well as the bioenergetics’ medicine approach (that consider some scoliosis coming from an energetic block …) it’s working on me going from physical to emotional level passing through the breath and pointing out many asymmetry that I have at skeleton level but not only in my spinal column! I do not have differences in the length of the legs and I do not have pelvis out of alignment! So where my scoliosis come from? Neither the first doctors that gave to me the shocking diagnosis and suggested the surgey neither the second one that gave me the chance (thaks to him!!) to follow another way (corset and postural gym, manipulation ..) did not tell me if my scoliosis was a structural scoliosis or functional one. I am sure it’s a structural one if we refer to the presence of the rotational component, but what is for me more “exciting” now it’s to understand the signal that during all my life came to me and that suggested me the idea that I could have had an energetic block caused from an anatomic asymmetry and/or from the emotional level (as many theory explained: Wilhelm Reich, di Walter Cannon e di Hans Selye). The attention I am posing (thanks to Ashtanga Yoga practice) on extending inhalation and exhalation, on using the nose instead of the mouth… ..at the emotional level make me able to dig into my past and to find the memory of me, of my mother worried for me. This come back to me thanks to Yoga..and it’s a very touching memory. But at the same time from the skeleton point of “view”, since I started to breath more correctly, posing attention to “inhalation” and “exhalation” I am more and more surprise in feeling, my chest and my abdominal cavities, able to move. Owhhh!!! I have never pose attention to that. I have never follow the movement and the changing of shape in my body. I am sure that the breathing’s disorder that started during my adolescence brought on my scoliosis. •	Differences between the length of inhalation..or exhalation if I am using only one nostril. For each one of this asymmetry and disorder…( cause or effect of my scoliosis? ), I would love to read study /books concerning the links of them with scoliosis. •	support asymmetry in the feet; due to a very strong concavity in the sole that can give instability in walking and cause different compensation between the two leg and more up in the spine.. I would love to read more documentation on such issues and work in “identifying possible suggestion” on exercise specifically helping me and other people with a scoliosis similar to mine (in term of possible causes, in term of direction of the spine twist…and so on). Scientists have already discovered that the nasal cycle corresponds with brain function. The electrical activity of the brain was found to be greater on the side opposite the less congested nostril. I know that Scientists have found that we don’t breathe equally with both nostrils, that one nostril is much easier to breathe through than the other ..so there are already many point of contact on this aspect between anatomy science and Yoga principle. 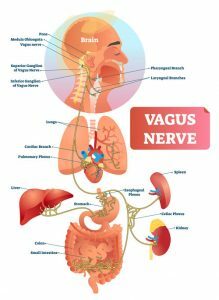 I have found article very interesting on “anatomy of the breath” (written by Leslie Kaminoff and The Breathing Project, Inc) where the aspects linked with breathing related disorders are very well pointed out and I would very appreciate to read any other article or study on possible effect on the body of a disorder in the nasal cycle! And more over possible effect on skeleton! David, do you have any bibliography on that? To be honest, my expectation about a deep reconciliation and worthwhile exchange between western medicine science and yoga therapy approach, is going more far;-)! I would love to know that medicine, following the assumption that a breathing disorder can cause scoliosis, would make a scientific study on a “sample” of yoga student with scoliosis (plus a control sample). Medicine would verify what Yoga Therapy theory say about pranayama exercise concerning for example the different impact of an asymmetric breath between right and left nostril on electrical activity of the brain and moreover on possible effect on skeleton particularly referred to spine side bending and rotation. If this will happen I would be very honoured to be part of the experiment and help the medicine in make any possible progress in this topic that is still very “mysterios” and I think “challenging”. After this my long mail I would thanks again you, David, for your having share with us in a such honest and clever way your experience of teacher and more over for having pose the attention on scoliosis and more over on the singularity that can differently characterize each yoga student with scoliosis. I want also thanks all the other students that made comments on your article.. I have found so many point of contact with each one of them that by the time I was reading, was difficult to not be touched . Baci and lot of love to all of you! Thank you so much for sharing your experience with all of us. You have brought up many interesting pieces to your experience. Over all, I would say that the scientific research is now coming out and starting to relate the more subtle emotional traumas or incidents with physical manifestation. I’m just now reading a book called “Scared Sick”… that references some of these ideas. Although it doesn’t directly relate to what you’re talking about it shows that the research is coming. I found it very interesting that you describe your mother as worried about your breath which you then describe as being full of anxiety. I’m not a psychologist or a psychiatrist however an interesting connection between worry, which is essentially anxiety and with a daughter with an anxious breath. Regarding where your scoliosis comes from if there is no leg length difference and no pelvic misalignment. Perhaps it comes from the very place you seem to be suggesting. This relationship to breath, or if you prefer… energy. Perhaps a block of either, but from where does that come? Seems like your on the path to finding that on your own. I wish you luck on your journey and am truly grateful that you shared your experience. Complimenti Fede per il tuo inglese e anche per i tuoi analisi premurosi di effetti respiro sulla scoliosi. Molto interessante. Congratulations Fede for your English and also for your thoughtful analysis of the effect of breath on scoliosis. Very interesting. Thanks to you David! thanks for devotion and love you put in sharing your experience with us! Very interesting! I have a student in her 50s with scoliosis. Her ribcage is different on each side sort of concave on right and convex on left. Her hips are not level as well. I first noticed while assisting a forward bend. She practices yoga with me (a more gentle/slow flow class for women 50+), pilates (mat, reformer, tower) and has a trainer. Any suggestions for that sort of scoliosis? I don’t think she has any of the diseases you listed but osteoporosis. I try to avoid too much specific advice when I’m not actually seeing someone and their particular problem. Like I said in the article, look for the underlying tensional patterns that may be feeding the scoliosis. So if her right hip is lower in the front, you might work on lengthening the hip flexors on that side… just add a little bit of emphasis and don’t try to tailor the practice to it too much unless you have that type of training. In general, you’re looking for what looks like it is too short and lengthen it. Thank you for getting back to me…I will keep it in mind! My basic intention with this class is strenghtening the center line and opening hips so I think she is in the right place! Thanks for the amazing article and excellent comments. I have removed scoliosis instantly without touching a young man (17 yrs old) by removing the emotional memory in his soul that the spinae muscle was blocking. The constant tension in his spinae muscle caused the scoliosis after 11 years of being locked. The wound was the memory of his parents divorce at age six. It’s as easy as directing your consciousness into the wound of the other person. It popped so loud that everyone in the room heard it and his circulation throughout his body instantly improved. Yoga is a fabulous psychotherapeutic tool however sometimes the emotional pain behind the spinal block is that great that it blocks their ability to flex the tourniquet hold on the cell body head in the dorsal root ganglion, thus maintaining a memory block to soul interface. Thank you for writing such a comprehensive article on this subject. I have lumbar scoliosis and believe this has created a lot postural imbalances over time. In fact, I put of starting any kind of a yoga practice for years because I thought I would never be able to bend this way or that. Well, four months into the Primary Series of Ashtanga, I am discovering all the imbalances created by my scoliosis and yet I am accepting them more and being mindful of them rather than frustrated and feeling held back. I remember that though my scoliosis will probably never straighten out, that the muscles around it can certain help shift the related imbalances and I already see and feel great improvements in my posture and my awareness of such. During practice, I lovingly notice the imbalances and breath into them and it has been intensely interesting to find out where these imbalances have occurred and how they surface in my practice. When I make little 1-2% gains in my ability to extent into a posture just a bit more, I don’t feel as held back by my scoliosis. At this point, I don’t even know if a full lotus posture will be possible for me, but I intend to keep working through and aligning with my practice as best I can anyway. I realized that none of the exercise I was doing before was helping and that I really needed stretching and alignment through yoga. I posted earlier about a young man where his scoliosis was scheduled for surgery and I removed the trauma that created the scoliosis and it released instantly, making a loud pop that you could hear throughout the room. I never touched his physical body nor discussed the original cause with him. All I did was remove the emotional trauma attached to the memory stored in his soul. The defense mechanism that was blocking the retrieval of the emotion was no longer needed and the spine instantly straightened. It has to do with the spinae muscles placing a tourniquet hold on the cell body head for the spinal nerve by compressing the dorsal root ganglion to block neural transmission of emotions through the afferent sensory neurons. Just yesterday I did the same thing for a 70 year old woman. Too bad she already had the surgery and had much scar tissue. For some reason, I can instantly read the memories in people’s souls that create the tension yoga seeks to release. A just reach into them and release the emotion and the tension in the body is gone. Only takes a few minutes and the person is not physically touched not do they even have to know what the trauma was. For the young man, the emotional trauma was his parent’s divorce when he was six years old. I just reached out my hand and felt the wound in his soul. Stop looking at the physical body impact of yoga and look at the effect of yoga on the anatomy & physiology of the soul and it all becomes simple. Lee, I definitely feel yoga’s affect on my soul as well. Nothing I have taken for depression has ever helped me and yoga does. I have not become instantly freed of karma or enlightened but I feel like many deeper issues are being released the more I consistently practice. I expect more to revealed in my deeper healing. If my scoliosis gets released somehow, I would be grateful. But maybe there’s some purpose for it now in my practice. I don’t know. I accept it either way. I thought I might have developed it in the womb, be being a breach baby for so long. I finally turned around at the proverbial 11th hour. If you have a gift such as you describe, that is truly a real gift then. The more I practice yoga, the more I see the body’s alignment with the soul and emotions. That is wonderful… You have just summarized the purpose of yoga as I see it. It is a great healing tool for the soul. could i pleeeease get in touch with Lee??? ur email address….or telnno. anything!! please! lemeknow. thanx. I’ve noticed intense backbends (after lots of warmups) clear the pain pretty much right away (In my case, foward bends feel good but don’t take the pain away) something about backbends compeltely takes the pain away. I would love to know anatomically why that is. Hi David, many thanks for this article! It felt really good to read all the comments and to see that there are more people with similar problems out there and practicing yoga! So here is my story: I was born with uneven hips, had a triple scoliosis by the time I was a teenager and only started to practice yoga about three years after I had my rods put in – which was quite late (in my mid-twenties, which still leaves me with a thoracic curvature of 29 degrees). I’ve been really gentle with my approach to yoga – no goals except not to injure myself and I wanted it to make me feel good. And in my off and on yoga practice of about three years I’ve found that the first change towards more alignment started with my right hip. Confirms your theory! Gradually, and with the right teacher, I dared to do more. I find the teacher essential, because with scoliosis you instinctively tend to go about doing things in the wrong way – so you need somebody to constantly point things out to you, even in downward dog. 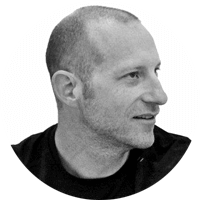 Some teachers I had were amazing – they were able to take away my fears and take me into postures I never dreamed of experiencing, but I’ve also encountered teachers (and massage therapists too!) who were too afraid to do any adjustments with me. My advice to people with scoliosis would be to only trust those teachers who seem to genuinely listen to how they feel, teachers who help you tune in more with yourself. If a teacher comes with an expectation of a perfect posture without wanting to brainstorm alternatives with you – then I would be suspicious. I’ve learned over the years that my own scoliosis allows me to find some asanas easier than others (binds are easier than arms out and shoulders open, cow face is easier than lizard, salavasana is easy, butterfly is easy – kurmasana impossible). I have been very careful with backbends to the extent that I ignored their existence up until very recently when I started feeling like I don’t want to hide my heart any more. I’ve found that backbends are great for that kind of stuff. Camel pose can feel fantastic! But I’m still very careful when I do it – for some it probably wouldn’t even classify as camel pose. 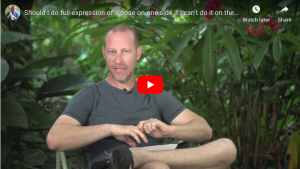 One more thing that was brought up in one of the comments – in my experience the nadi shodhana pranayama helps me feel straighter in a very subtle way. But that’s probably true for anybody, and not just for people with scoliosis! Thank you for the article. My 11 year old daughter has mild functional scoliosis. I’ve been practicing yoga for the last six years, and in between your article and what I know, she’ll be on a healing track. Thank you thank you thank you! Do you have some suggestions about not so good asana and recommended asanas?.. I love love backbends but latter i feel i`m more misaligned, my clavicles are really misaligned and the right one makes sounds..
Would love to have your answer..Thank you!!! Great subject. Thanks for your post. As a collegue, I’m happy to comp you if you want to join us. There will be time for online Q&A. Just let me know if you want to join. During my training as a yoga therapist we were also told that scoliosis clients should be required to commit to sessions of psychotherapy or counseling as there is a strong mental /emotional aspect to this condition. This was a great article. My 14 yr old stepdaughter has scoliosis which developed VERY quickly this past year into a 54 degree curve. As it has grown she has also developed “razor back” (laymans terms) and will be undergoing surgery in November. I see a lot of comments about the misaligned ribs and it is my understanding that this is the “razor back” effect that I speak off. She is having an additional surgery during the spinal realignment where they will remove 1″ of the center of her right ribs, leave them to hang and they will then refuse themselves correctly. As for yoga, I am a Hatha instructor and as she quickly grew (crooked) we noticed she had a harder time on the occasions she did yoga with me so I began some research and the overall consensus was to avoid backbends at all costs which would relate to the above comment by Melissa who is having trouble with them… twists seem to also be a contraindication to scoliosis. Her surgeon has advised that no, you cannot correct the lateral curve with yoga but some poses along with massage may relieve the pain simply through breath and movement. It is a pretty daunting situation to watch as as she grows she is in more and more pain after standing long term and sitting in hard chairs. As much as we wanted to avoid surgery, we did a lot of research and learned that the older you get, the surgery has much higher risks after age 20 and goes up as you age but is still they only real way to correct the curvature as much as possible. It will never correct it 100% but is predicted to be corrected up to 75% from where it is now. I simply advise those with a yoga practice to not only read your writings but to do a little more extensive research on what poses you should and should not do as with any injury or medical condition. I’m sure you will agree that as yoga instructors we can see misalignment in our students but we are not mind readers so for those students reading this it is key that you inform your yoga instructor of any major medical conditions, injuries or surgeries before embarking on your yogic journey! Thank you for sharing your experience and giving us all more food for thought. 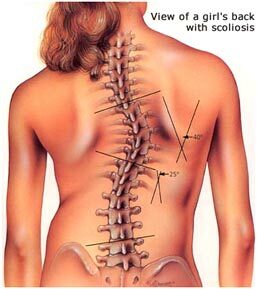 Scoliosis is very complex and varies person to person. I agree that there is always further reading and research to do. Especially if you find yourself dealing with specific populations. As for the students out there, your yoga teacher will appreciate any and all details you can provide them about your specific situation. Sometimes an email ahead of time is better than a half hour conversation right before class though. I am so grateful to have found this web site and all of your wonderful articles. You are just the person I have been looking for! I just came across this article today and it was something I am currently struggling with. I have lived with scoliosis since I was the age of 12 but knew long before that I would most likely have it due to the strong genetic chain of scoliosis in our family. When I was 20 I had to have my thoracic spine fused and 2 rods placed in my back. Later in life, when I was about 28 I found ashtanga yoga. Having been very uncomfortable for years I finally felt some freedom within my own body again. To make a long story short, I know own a yoga studio and I am still practicing primary and intermediate series 6 days a week. Here is where the problems are starting to occur. It took me a couple years to actually be brave enough to come into Urdhva danurasana again. Pre surgery I was extremely flexible and in gymnastics for years which helped I’m sure. I don’t think dropping back into the asana will ever happen because of the rods but I was to the point of walking down the wall and getting myself into some of the back bends in intermediate series as well. I was happy with this until I started to experience pain that was pretty intense. I kept practicing for a few months but now I’m to the point of laying off most of these asanas. My lumbar spine, below the fusion, is spiraling in and still has a pretty large curve in it. The question I struggle with is can I hurt myself or am I just to the point of working through some deep granthis? For years I practiced and really the tightest part of my back bends were due to my tight shoulders and chest. I never felt this discomfort in my back like I currently do. It often hits me after the practice and not during. I am working with a chiropractor and I’m hoping this will help so that I can continue to practice. I feel like I need more guidance though and I wish It could be from another ashtangi. I am not yet 40 but it’s just around the corner and I want to continue this practice for many, many years. Some help would be of great value right now. I would love to have a conversation with you and hear your thoughts and anyone else that has experience with this. Thank again for all this valuable information that you are sharing with the yoga community. Forget the granthis for a moment. You need to be very careful doing deep backbends with a fusion. You are going to be putting more pressure on areas of your spine than they were designed to take because of the fusion. I can’t say if you have or have not injured something… at this point only an MRI would be able to tell you that. Please proceed with caution and find a teacher who will work with you differently based on your very different spine. I’m glad to read your article. My son is having rods in his back as his scoliosis progressed from 48 degrees last year to 56 degrees this year all while getting chiropractic treatments. I had great faith in the chiropractor who promised us he could almost heal his curve. In the meantime his ribs have twisted to his back and he has a large hump and experiencing lots of pain every day. He also has one leg 1.5″ shorter than the other, so I’m guessing pelvic misalignment, etc. The chiropractor did manage to help with the pain. At this point, we are going with the surgery as he is 17 and we feel like we’ve researched everything we can and feel good about our decision. I have 2 other sons with the beginning of scoliosis and I am going to start them on yoga to see if we can prevent surgery for them. The 12 year old is experiencing lots of hip pain, so may be good to check on his pelvic alignment too. Thanks for all the insights. hi david, thank you for your well written article. also thanks for the people who added their comments and insights. I have a question for you. can you recommend any particular asanas for a person with scoliosis of spine with lateral displacement to the left in the upper to mid thoracic (ribcage) area – T3-T9? I would suggest that you just take an overall approach to spinal health, including asana in multiple directions as opposed to looking for a particular asana. There are a number of books out there on back health and scoliosis. As someone with upper thoracic scoliosis to the right, I can say that since I started getting back aches a few years ago (because of the scoliosis), the only poses that noticeably relive my backache are back bends. I don’t know why but not matter what I do, they feel better but don’t go away but with backbends the pain is gone! I just learned my 12 year old son has scoliosis and I want to be proactive about it so he can avoid problems later. I have read that yoga can help. We live in rural Montana and will need to practice yoga at home as there are no yoga classes locally. Do you have any videos that you can recommend for us beginners? HI DAVID!! I JUST FOUND YOUR ARTICLE AND IT IS GREAT!! I’VE BEEN LIVING WITH A LUMBAR SCOLIOSIS FOR 23 YEARS AND I’VE DONE ALL THE THERAPY. I’VE BEEN PRACTICING ASHTANGA YOGA FOR 6 YEARS. AT THE BEGINNING MY BACK HURT BUT I LEARNED TO KNOW MY BODY. ACTUALLY I COMBINED ASHTANGA WITH PILATES (USING THE REFORMER) AND HAS BEEN THE BEST THERAPY EVER. I STILL HAVE BACK PAIN, DUE TO YEARS AND BECAUSE LIKE THE DOCTOR TOLD ME, IM NOT YONGER ANY MORE, BUT I HAVE BEEN ABLE TO STOP SOME CONSECUENSES BY DOING EXERCISE 6 DAYS A WEEK. I STILL DO SOME EXCERSICES THAT MY FIRST DOCTOR TOLD ME TO DO, AND WITH THE YOGA PRACTICE AND PILATES, I FEEL LIKE IM 20 YEARS AGAIN. I’VE BEEN IN MANY YOGA WORKSHOPS AND BEEN INTESTESTING THAT ONLY ONE YOGA TEACHER HAS SPOKEN ABOUT BACK PROBLEMS. THANKS A LOT FOR YOUR DEDICATION!! !